Here you can find an up to date inventory of the latest goings on, from small club gatherings to some of the huge international events. 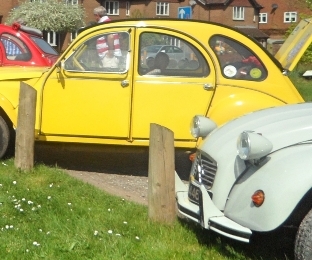 Life is never dull when you have a 2CV, so get out there and join in the fun. You’ve seen it in the winter when everything is cold and damp, no fires in the furnaces, no trains, half the rides dismantled for maintenance. Now come and see it in full flow! The Hollycombe Steam Collection, (just off the A3 at Liphook, Hants GU30 7PL) are letting us use their large field to gather in – this will be open from 10.30am, Admission to the museum will be from 11am, trains run from 12 noon and all the fairground rides from 1pm. Parking is free and the museum entry will be a special £10 per person charge, which will allow unlimited rides on the railways, fairground rides and cinema. You could just sit and chat in the field for nothing but there's more inside than you might think. Bring a picnic or use the café which does hot snacks, light refreshments, ice creams etc. 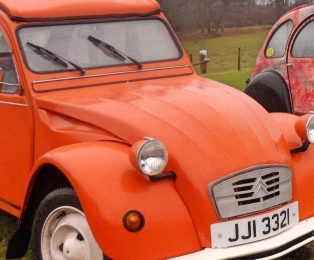 Other clubs have been invited and hopefully the gathering will reflect our small part in this Citroën centenary year. Any queries, contact Sean: scullen.sc4@gmail.com or 07906 077138. 8 - 8.30pm at The Yew Tree Inn, Hayling Island. Saint Amand Montrond (18). Full details: www.cherdeuches19.fr. Combe Abbey Country Park, near Coventry. This is the major Citroën event in the UK in this centenary year, and is getting ever closer – and you can now book and pay online! But if you have already registered, you should have received an email to let you know. Over 350 registrations received so far comprise a varied mix, including international enquiries from as far afield as Australia! This is just the start – we anticipate 1,000 cars or more. 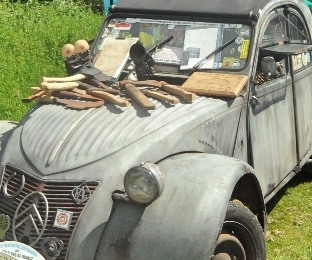 Now that bookings are open, there is no need to register – simply go to: www.citroencentenary.org.uk and book your ticket! Why book in advance? It helps us to plan the event in terms of numbers, assists with cashflow – and saves you money, because the on-the-gate prices will be higher! We can also email you direct with updates. Remember that this is effectively two events for the price of one: a blend of ‘conventional’ rally and a mobile event in conjunction with MotoFest - it’s everything you’re used to, and something else that you’re not! One thing is certain: this event will remain unique – there can only be one Centenary! First of all, this is the opportunity for all British Citroën owners to come together and celebrate 100 years of Citroën car manufacture. This is for people above all, then the cars. As enthusiasts, it is vital that we continue to support and promote the Citroën heritage, as indeed has always been the case. The aim is to bring the marque’s heritage and achievements to the attention of the wider public by means of an outward-facing event. 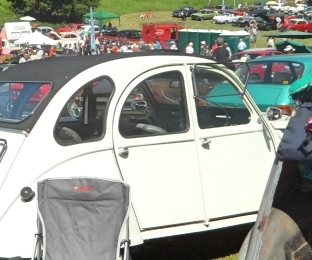 The location of Coventry is ideal for this, as the UK’s ‘motor city’ and Citroën UK’s base, with its central location and its role in hosting the hugely-popular MotoFest event. 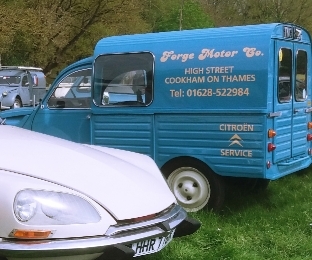 Every Citroën-related vehicle is welcome – of every year, and including all kit, one-off and modified cars. Queen Elizabeth Country Park. Vehicles must arrive before 9.30am and stay until 4pm. Free entry if exhibiting. Download an entry form here and send it in by May 11th. La Ferte Vidame, Near Paris. Full details here. Samobar, Croatia. Full details here. The theme will be the ''Swinging 60s": don’t say you haven’t had enough warning! £1 6 / u n i t / n i g h t   t o   i n c l u d e   e l e c t r i c   h o o k - u p . Usual Friday buffet, Saturday scenic tour, BBQ, and other interesting things. If you have any ideas for upcoming events that would be of interest then please contact Peter.